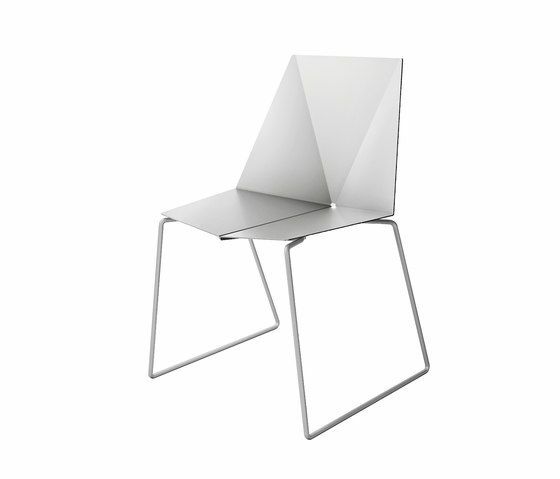 em-chair is the new collection 2016, lasered and folded from one aluminum plate 3mm. For indoor and outdoor it offers multiple use, as the powdercoating is weatherresistant, water flows off. New colorcode in series is pearlgrey metallic warm RAL 7048, giving a sleek and warm look. Geometric structure supports modern light architecture and contrasts historic pieces. Combine with skidframe in black, white, pearlgrey metallic and chrome. Upholstery is developed as part of oxit-philosophy to match this chair uniquely. Be free to change, give multiple profiles to the chair, be seasonal or outdoor waterproof. Change from lowprice to pre- mium or choose light-lining felt in woolquality 5mm. We use special antislip-textile for sleipfree seating, manufactured sewing in highest quality from german specialists. For project and public use we fixate with velcro, easily to refurbish and low cost. em chair stacks up to 10 chairs and is follower of kite chair, the first totally unburnable chair introduced 10/2014 by oxit at the orgatec in cologne. Several offers of large brands reflect the interest in this innovation. New is also the seatshell lined with european bio-saddleleather, hand-picked by oxit in premium 3mm quality, tanned and dyed with plantcolors. We bring leather on aluminum with thermoprocessing - giving a different look frontside/backside. Beautyful in whiskey on white, black and pearlgrey warm metallic. oxit is a new studio for productdevelopment and design founded in 2013.